Last week I received an email from an editor of a local publication who wanted to do a story on Star Brows. Naturally, I was ecstatic and spent a good portion of my week preparing the perfect answers to all of her interview questions and even took the time to snap some new “action shots” of me at work to coincide with the interview. Unfortunately, a few days after I sent her the materials she requested, she emailed me back to say that her senior editor was “no longer interested in the story.” Sadly, they only wanted to focus on a service I no longer offer. Needless to say, I was disappointed. Who wouldn’t be? Or should I say, who hasn’t been? Exercise – Come on people – the magnificant Pacific Ocean is in our backyard and heading to the beach is one of my personal favorite forms of exercise. In fact, while I was in Minnesota last week I got a new pair of running shoes (to walk in). While I walk, I put an ear peice in so I can pray for people, sing, and yell about things I’m angry about (Don’t worry! People won’t look at you weird. It just looks like you’re talking on the phone!). But even if you’re not near an ocean, you can still find a place to walk and get a work out in, while your getting other things out! Take a dance class – I teach a couple of children’s classes at Coastal Dance and Music Academy on Grande Avenue in Arroyo Grande. They offer adult ballet, jazz, tap and hip hop. If you’re not in Arroyo Grande, there’s probably still a dance studio near you. Look it up and get a friend to join you! Dress up and go out clubing with friends – Native in San Luis Obispo is my favorite place to go if I want to dance the night away (and be the oldestc woman in the club!). 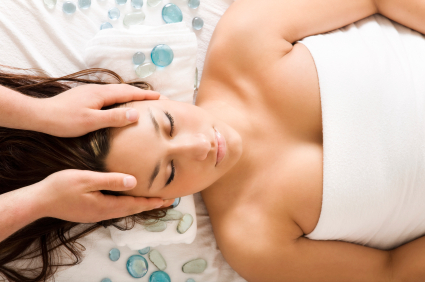 Get a spa service – This is one of my personal favorite ways to destress and relax. I go every month. And in case you didn’t know, I offer luxurious facials and relaxing or deep massages at Star Brows too! Get a chiropractic adjustment or an accupuncture treatment. These are also staples for me – I can give you the names of some excellant people…call me. Friends, Food & Family– The great thing about each of these is that they’re good together or enjoyed seperately. I married an Italian, who is also a chef, so we are real foodies; but I also adore the “soosh” (sushi – I think Umi is best in my area!). And if you have children close by, (we have 4) they bring joy unspeakable. As for friends, make all kinds so you have choices for who to hang out with! What about you? I’ll bet you thought of a few ways to destress while I was talking care to share? Love this post, Linda! These are some great ideas for easing stress and calming our spirits after a disappointing experience. Disappointment may be a reality of life, but there’s no reason why we have to dwell on it and let it get us down when we could be dancing…getting a massage…or eating, drinking, and spending time with family instead. didn’t know you had a blog…was fun reading, and maybe I’ll even use some of your tips!!! what kind of stuff (something acid…. )am I suppose to use on my skin….see I learned something new already! I am so glad you enjoyed it Beth! You can get it to come to your inbox when there are new posts if you’d like. Look at “The Isles of Beauty” post, it lists products you can get at the drug store! Have a good one Bethie! « Wear red lipstick Friday!